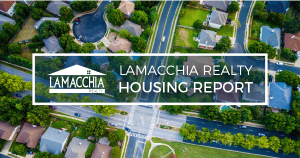 This Lamacchia Housing Report presents a full Mid-Year report on overall home sale statistics and highlights the average sale prices for single-family, condominiums, and multi-family homes in Massachusetts and New Hampshire for the first six months of 2015 compared to the same period (January 1st to June 30th) in 2014. To watch Anthony explain this report on WBZ News click here. This past spring was the best time to sell a home in over ten years. Inventory was low and demand was high which created countless bidding wars that resulted in many homes selling for over their asking price. This report very clearly illustrates the incredible impact that this tough winter had on the market by starting things off much later than normal. This is why June was the first month since February that home sales were up. We fully expect July and August to be up as well. The good news is the market is currently busier than it typically is during the summer which is a great sign because it shows that the down months will very likely be made up for in the months to come. Despite a very late start to the spring market home sales are up slightly in 2015 compared to the first six months of 2014. There were a total of 34,005 homes sold this year compared to 33,665 in 2014. That represents a 1% increase. Based on the fact that January, March, April and May home sales were down; sales being up even 1% over this six month period is actually very good news. 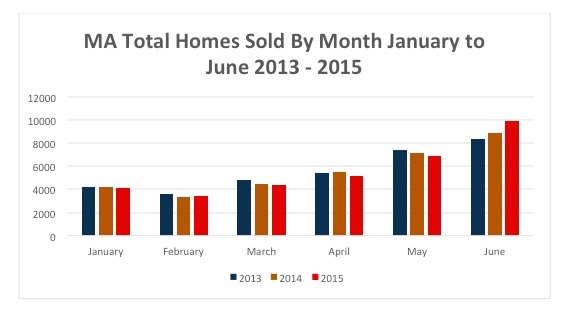 June was the month that really made up for the losses with a 12% increase in home sales. It wasn’t until June that we had a break out month for the market because the entire market was log jammed and delayed due to the winter snow. Overall home prices increased over 3% from January 1st to June 30th with an average of $379,679 for singles, condo’s and multifamily homes compared to $368,542 in the same period in 2014. This is only half of the increase achieved from January 1st to June 30th 2014 to that same period in 2013 when prices increased 6%. This is not surprising considering that home prices trail home sales. When home sales speed up prices increase faster and when home sales slowdown price appreciation slows down. 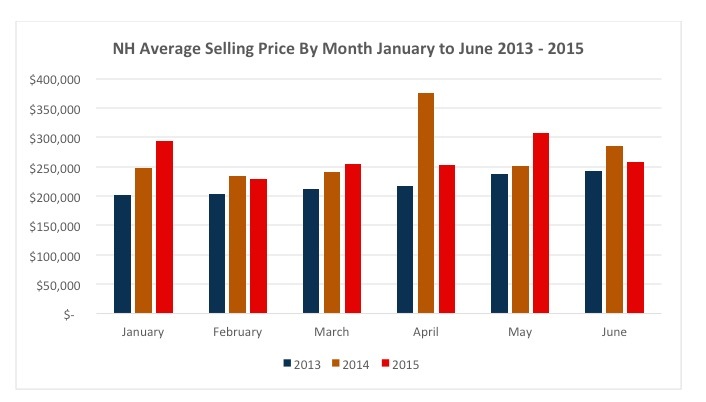 Since home sales in the first six months of this year are barely up prices were slower to increase as well. 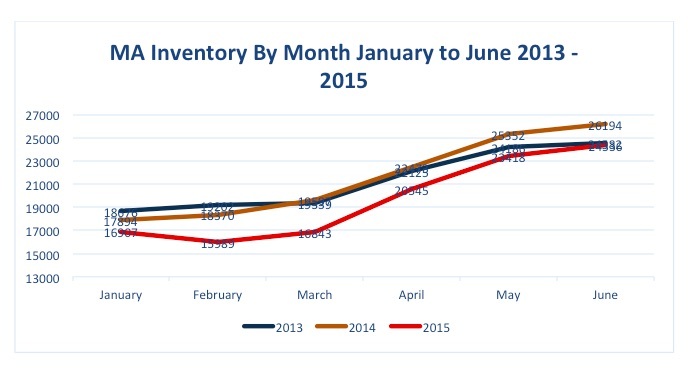 Overall home sales were down 2% from January 1st to June 30th with 4,330 homes sold compared to 4,434 sales in 2014. 2014 was also down slightly from 2013. 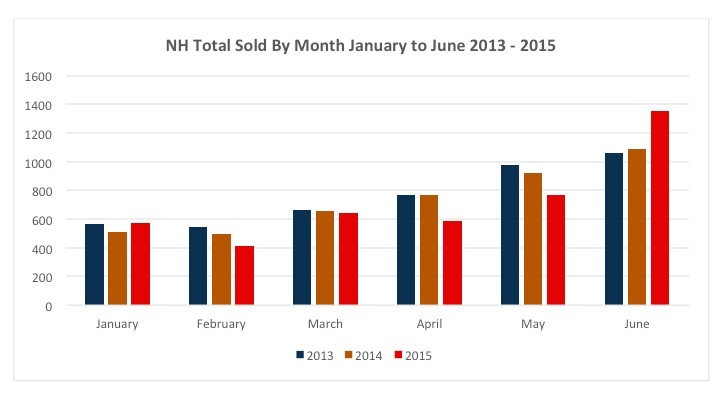 This decrease in home sales is not a surprise considering the fact that home sales have been down in Southern New Hampshire for 4 out of the first six months of the year. Sales were down in February, March, April and May. June sales were up 25% but it was not enough to make up for all of the down months. Since home prices trail home sales; prices did dip slightly for the first half of this year with an average price of $265,705 compared to an average of $267,989 in 2014. Once again the only thing to blame for this is the snowy winter. We do not expect prices to continue to decrease. There were 59,902 homes listed for sale in the first six months of the year according to MLSPIN compared to 59,620 during the same period in 2014. This is great considering homes listed were down 34% in February. Once the snow was gone people were listing homes at a rapid pace. 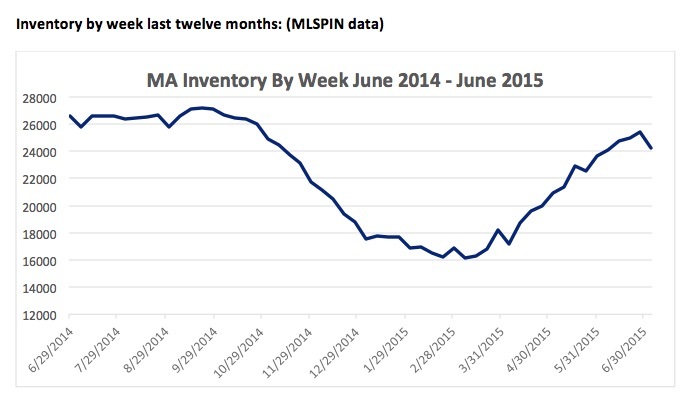 Inventory of homes for sale has substantially increased since the spring but is not quite as high as it was last year which is good news because if inventory comes up too much the market will really slow down like it did late last summer and fall. There are currently just over 25,000 homes on the market compared to 19,700 homes on the market 90 days ago at the end of April and 16,216 homes for sale on March 15th. This represents over a 50% increase in homes for sale since March 15th. This has an impact on the speed at which buyers view and make offers on homes. The more they have to choose from the slower they look. Anthony explained this in great detail in his recent Boston Globe Column called Sorry sellers Spring is over. The best indicator of home sales to come is pending home sales. These numbers tell us total contracts accepted but not yet closed. From January 1st 2015 to June 30th 2015 there were contracts accepted on 46,469 homes compared to 43,682 in the same period in 2014. This represents a 7% increase which is fantastic considering how delayed the spring market was. Not all pending sales end up closing because contracts do fall through this is the best data we have to confidently predict that the market is going to make up for the down months we had earlier this year. 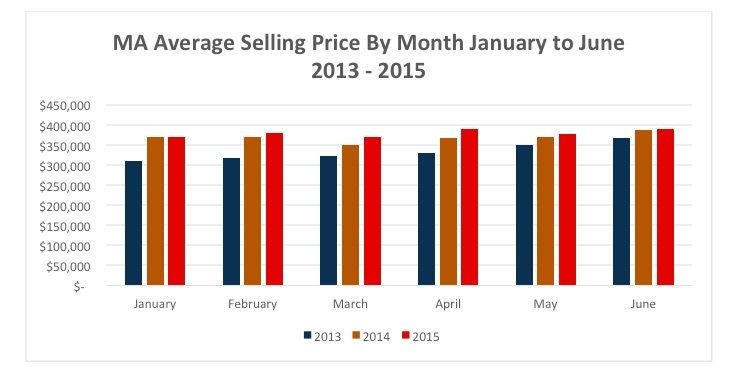 Back in January we predicted that 2015 would be the best year for overall home sales since 2005. When we gave that prediction we listed 9 Reasons why. We still feel this will be the case despite homes sales only being up 1% over 2014. As long as demand keeps up inventory will not get too high and as long as that is the case we are confident that we will have our best year since 2005.